Mista Lista sat down with the KaZoo family this past weekend to do some planning and goal coordination of their next steps, now that most of the necessary, smaller, and easier tasks are out of the way. Note: Painting the remaining rooms doesn’t even count as a smaller, easier task because the KaZoos will have to rent equipment to be able to reach their high ceilings and move their heavy furniture to do so. Mista Lista does take pity on the KaZoos every once in awhile. Mista Lista advised the KaZoos to tackle future to dos in a more time and cost-effective way than their frenzied spring/summer get-it-done-yesterday madness approach. The new plan is to tackle one big project, one medium-sized project, and three smaller projects, plus conduct research and purchase materials necessary for forthcoming projects in November. Here’s what Mista Lista helped the KaZoos plan for the month of October. Painting the living room, dining room, and the rest of the kitchen is the big project of the month. If the size of these walls (over 13′ high, and running the width and length of the public spaces in the house) isn’t enough to earn the Escalade designation alone, having to rent equipment that costs money and requires logistical planning is also a big deal. 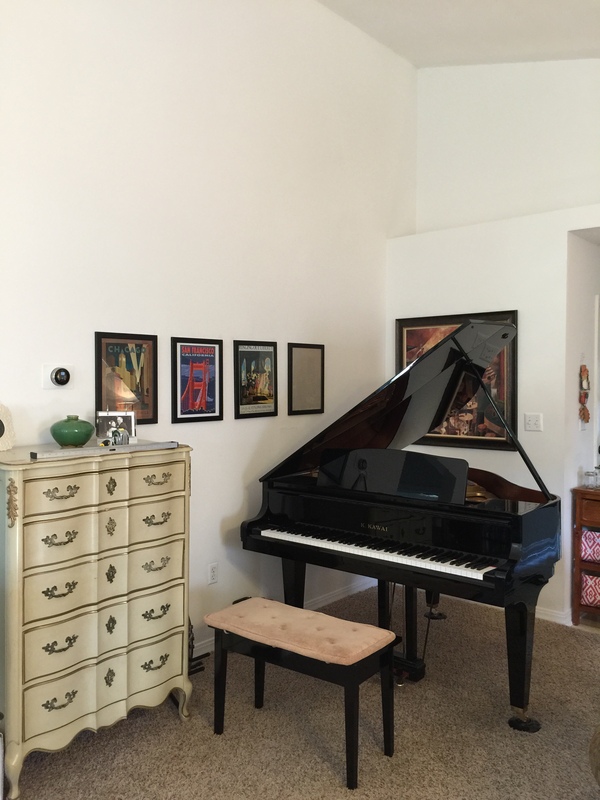 Note the height of the ceiling over the height of the baby grand piano with its lid raised. Yes, that is an empty frame on the wall. It’s a placeholder. Coming in second place is putting the finishing touches on the yard, and by this we mean finish clearing the overgrown easement behind our house (note the ginormous, blooming wild shrub+ vine combo), replace broken sprinkler heads, finish edging/mulching the flower beds in the backyard, and transplanting crape myrtles to the backyard fence row for low maintenance privacy and shade. Sounds like a pretty big job, right? It is. This might be more like a BMW 7 series sedan instead of a Camry sized job, but all of these things can be accomplished in one long day’s work without needing extra equipment, hence the mid-size designation. You may be thinking, um, but wouldn’t a Bobcat rental help with clearing the easement? Yup, if only we could get one back there. Painting the house numbers, exterior light fixtures, and mailbox is one of our bite-sized projects for October. We plan to ORB the light fixtures, but the mailbox has to stay a standard black per HOA regulations. We haven’t decided what color to paint the supremely faded house numbers yet (black like they were before [we think]? ORB’d to match the light fixtures? )…any preferences/suggestions? We’d really like to upgrade the numbers down the road to some of those awesome art deco-looking numbers. All in good time, right? Fixing up the fireplace is also on the list. We got a coupon in the mail for a chimney sweep, and we definitely need our fireplace inspected and cleaned. It is supposed to be a gas fireplace, but there are no gas logs…and where they should be is a grate for actual wood. The inside of the fireplace is all black as if the people who used to live here might have burned real wood in a fireplace not really equipped to handle it. Although we don’t really need a fireplace down here, we would like it cleaned professionally. No time like the present, right? Sprucing up the front entry to the house for fall is also on the hit, er, Fit list. 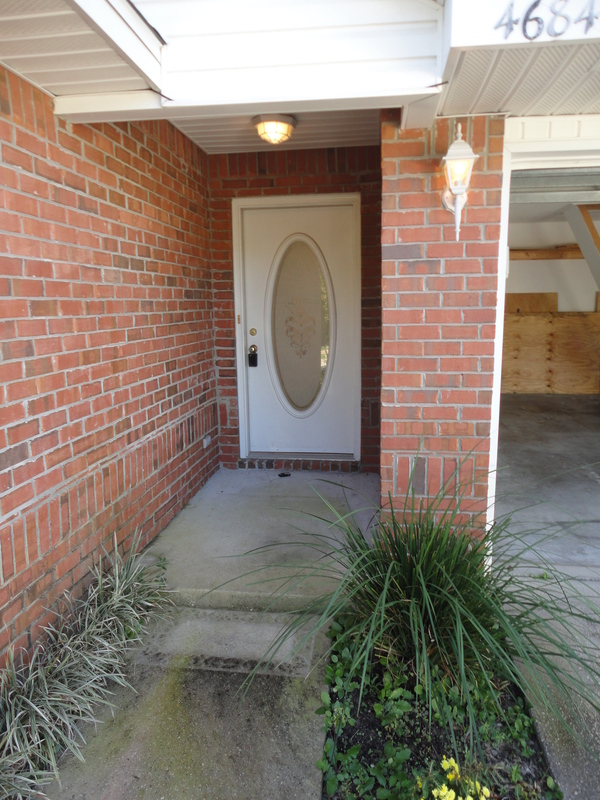 Nothing says welcome like mossy bricks, a mud/dirt dauber nest, and a dirty front door, right? We know we are supposed to leave the nest because these insects rarely sting humans but do eat spiders (take them all! ), but this nest looks like it has long since been abandoned. We I would like some fall flowers and a nice wreath for the front door, so this may involve breaking out my crafty skills. Right now, the pots/plants you see in the picture above no longer occupy this location, and the front looks like a barren wasteland of brick pavers and dirty concrete. The small blue and green pots were temporary guests of the front porch while their kitchen home was filled with drywall dust, and the petunias that look so healthy were ravaged by mealybugs…along with a lot of other plants in my yard. Rage. I was able to launch a fairly effective counterattack on the mealybugs and only lost three plants, but the petunias were one of the three that didn’t make it. The only thing I found to be effective against the mealybugs was spraying my plants with rubbing alcohol (that’s the professional recommendation–not just a stupid idea I had), and the three plants that didn’t make it were so damaged that the alcohol sent them over the edge. Mealybugs are the worst, people. If you see little grayish-white bugs that look fuzzy on your plants, grab your rubbing alcohol, put it in a spray bottle, and spray like crazy (preferably not on a rainy day where its effect will be overly diluted and not in the sun where the effect of heat + alcohol will burn your plant up). I thought I had eradicated them from our yard a month ago, but I recently had to launch another alcohol attack after finding them on some canna lilies that they had previously ignored. So frustrating. I’m now stocking up on rubbing alcohol and inspecting all my plants religiously. Apparently they are supremely invasive, massively destructive, and highly resistant, so gardeners beware. Our neighborhood is also having a garage/yard sale in October, and we plan to participate. We’ve got quite a few items to sell, and Craigslist hasn’t been our friend of late. We’ve had several people call about pieces of furniture and set up a meet, only to not show up. Thanks for wasting our Saturday that could have been at the beach, people. You know who you are. We’re having to post ‘serious inquiries only’ on all our listings, and even still….Anyway, we’ll see how it goes. We’re not totally enamored with the idea of a garage sale, but if we can clear out some large clutter and make some money to go towards other purchases and projects, it might be worth it. We would like to replace our dining table and chairs with a farmhouse table and some new chairs/benches/something. Our current set is a hand-me-down from my parents and not really our style, even though the mahogany finish is nice. More importantly, two of the six dining chairs are in need of a major re-upholstery job (two have sagging seats, several have batting coming out, and the fabric is stained, worn, and dated) that is beyond our skill set, and the table isn’t safe. One of the legs snapped last year in the city (super scary!) and my dad helped repair it well enough for it to be safe for use until we could do better. Unfortunately, two of the other legs are now cracked and threatening to do the same thing, so it’s only a matter of time before this table gives out for good. We recently learned of a local furniture maker who does awesome solid wood, custom pieces, so we want to investigate this vs. making a table and benches ourselves using plans from Ana White. And that’s our October. What projects are you tackling this month?